Better skin made easy with The Better Skin Co. Lava Magik and Mirakle Cream! Looking for effective, multipurpose products that won't break the bank? Then here are a couple of clever ones from The Better Skin Co. that you will wonder how you ever lived without! 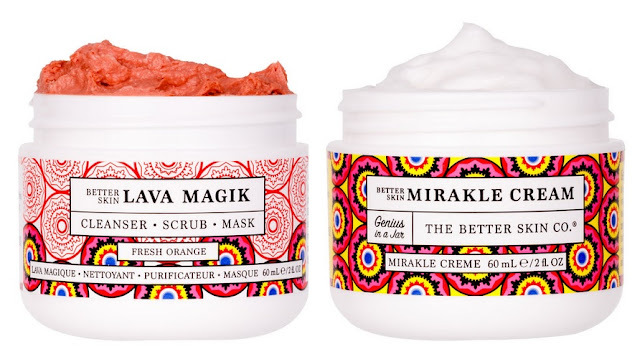 Better Skin Lava Magik - 60ml - $40 - a magikal multi-tasker that can be used as a daily cleanser, exfoliating scrub or revitalizing mask! Contains skin cleansing volcanic lava from France enriched with nourishing calendula, sweet orange and grapeseed oils, cucumber, parsley and chamomile for healthy radiant, more youthful looking skin. It's a great daily cleanser if you don't have a lot of other exfoliating going on in your life - just use a tiny amount mixed with water. And/or use twice weekly as a scrub - just apply to wet skin and massage for 30 to 60 seconds paying particular attention to any dry or rough looking areas. Then once or twice a week apply a generous layer to the face and leave on for 5 to 10 minutes - when removing moisten fingertips and massage in a circular motion for additional exfoliation. I especially love it as a mask, for 10 minutes you get the additional aromatherapy benefits of the great orange scent - such a great mood lifter! Better Skin Mirakle Cream - 60ml - $43 - an all-purpose cream that reduces the appearance of fine lines and wrinkles, increases radiance and luminosity, soothes dry skin and helps reduce the appearance of dark spots with an ingredient rich recipe of beautiful ingredients such as coconut oil, sea buckthorn, shea butter, cocoa butter, aloe, and soothing algae to help moisturize the skin; peptides and hyaluronic acid help skin appear smoother, more youthful and radiant. It's a rich cream without being heavy - my combination skin found it to be a bit much in my oily areas but it feels great everywhere else - I've also had this weird dry patch on my neck from the winter that just wouldn't entirely go away but after a week of using the cream it's totally gone - this really did prove itself to be a "mirakle" cream - I also appreciate the lack of scent - there is nothing worse then an overly perfumed moisturizer! Available now at select Shoppers Drug Mart Beauty Boutique stores and Murale stores across Canada. Labels: cleansers, Mask, moisturizers, Scrub, The Better Skin Co.